The moment you all have been waiting for ... after 11 chapters ... SPOILERS FOR CHAPTER 12!! Ironically ... in the Anime, they did it after 11 episodes too lol. The difference is, Nagisa's taken by surprise in the Anime while Nagisa's a willing participant in the Manga heh. - Picking up from Chapter 11, Nagisa fell down the tower where the Cadette [Little Sister] were kept in captivity. The Aînée [Elder Sister] have to rescue the Cadette by riding their horses to the tower. - The leader, Amane yelled Hikari's name and told Hikari to jump down the tower as she's there to catch her. In Amane's arms, Hikari begged Amane to save Nagisa. - Amane steered Star Bright to Nagisa's side and asked Nagisa to hand on. - Nagisa was like 'I can't hold on anymore!!!~'. Suddenly Shizuma arrived, yelling to Amane that she'll handle it [LoL like hell she'll let Amane touch Nagisa]. - Shizuma managed to catch Nagisa as she fell. - Shizuma then turned back to Amane and taunted her that she's leaving then lol. Caught in the moment, Amane steered Star Bright back to position, told Hikari to hold tight and galloped away. - It was a close battle between Shizuma and Amane but in the end, Amane won. - Meanwhile, Nagisa and Shizuma were sitting under a tree, chatting about Shizuma's memories [Not really sure what they said], feelings of happiness, sadness and stuff. Nagisa then realized Shizuma's feelings when her beloved died [Kaori]. - In the end, Shizuma [Not really sure either] said something about the feelings/memories of sadness and bitterness disappearing. - Placing her hands on Nagisa's shoulders, Shizuma confessed to Nagisa that she now likes Nagisa and will give her all, body and soul to Nagisa. - Shizuma's fingers lingered around Nagisa's lips, she said 'My cute Nagisa ...' and moved closer. - Before Shizuma moved even closer, Shizuma asked Nagisa for permission [Can I, Nagisa?]. - Nagisa just hugged Shizuma in response. - Both of them kissed. Sorry, I'm not really sure what was said in the Nagisa and Shizuma scene haha. I'll post up the rest when the translated's up, if you can't wait, run down to Yamibo, for the RAWS! SQUEE!!! I've never been that excited since ep 12 <3 Thank you for the summary! 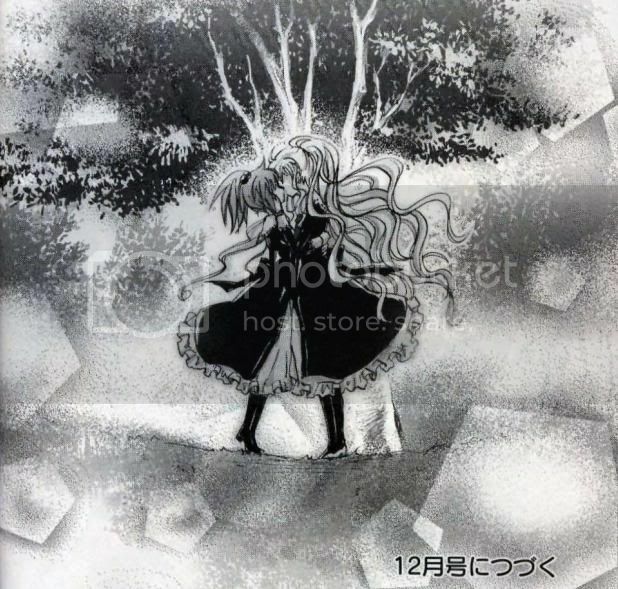 ~coughs~ akayuki actually in the anime, Nagisa got 'attack' by Shizuma with a kiss in episode 12 not 11. Anyway, I can't wait for the translated version to come out. Thanks for sharing akayuki. Nah ravyn, Nagisa wasn't attacked in anime. She willingly follewed Shizuma to her room for a bath after the kiss isn't it? to ravyn, um, I did said it was AFTER 11 episodes ... which means I meant Ep12 lol ... maybe it's a little confusing XD. I won't say Nagisa was attacked, probably just taken by surprised but not unwillingly, she's just a little confused/blur at that time. I can see there is confusion in anime while in manga, Nagisa is not confuse or refuse at all. Wow very different. I don't know why I just loved manga version but I really hope manga version should be animated. Make it a OVA...I don't mind buying. Whoa kiss already?! That's quick..I guess naked is "giving your body and soul" :-D Go Shizuma x Nagisa!!! ok. first, ilove this blog so much and can i ask you something? i only read thai and english so in Yamibo it's full with chinese letters. so can you tell me or link me to strawberry panic scan forum? please? the chinese version is out on Yamibo website.